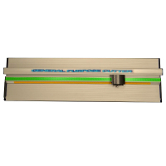 The PowerHouse General Purpose Cutters are designed to cut a wide variety of sheet materials, from paper and cardboard to foam core and corrugated materials — up to 1/2" thick. These handy portable utility cutters can be set on a table top or mounted on an optional stand. The 40" PowerHouse General Purpose Cutter by ADSS is designed to cut a wide variety of sheet materials, from paper and cardboard to foam core and corrugated materials. 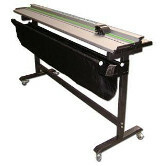 It is a handy portable sheet material cutter that can be set on a table top or mounted on its own stand. The 60" PowerHouse General Purpose Cutter by ADSS is designed to cut a wide variety of sheet materials, from paper and cardboard to foam core and corrugated materials. 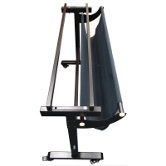 It is a handy portable sheet material cutter that can be set on a table top or mounted on its own stand. Add a stand and waste catcher to your PowerHouse cutter. Available to fit the 40" or 60" cutters.